My first chance to come to Mumbai when I got the Interview call of NITIE (My Campus). I came a day before my interview and that’s the day where I saw a Nature’s beauty at its max. It was morning 9 O’clock when I came to God’s own Campus and that’s the day when I came to know the meaning of this phrase, a little bit drizzling which enhances the beauty of it. The room which was allotted to me was on 8th floor and the view from there is unimaginable because we all know that Mumbai is a city of Concrete and a place and a view like this drove me crazy. All this attracts me towards it but I am a mechanical engineer and in here we all know what does that mean. After joining it I came to know the culture of it and the relationship between juniors and seniors, which makes any institute fruitful if we have such seniors. 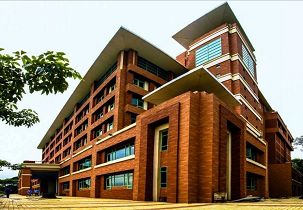 With decades of expertise, the institute has become one of the top business schools in the country and has been recognized as one of the 15 Centres of Excellence along with the Indian Institutes of Technology (IITs), Indian Institutes of Management (IIMs) and Indian Institute of Science (IISc) by the Ministry of HRD, Government of India. It has more than fifty years of legacy in Industrial solutions and management which most of the institutes didn’t have. It does have a trimester system and a really quant-heavy syllabus, which is why people from non-engineering backgrounds are not accepted by it. As no one has studied in two campuses at the same time, so it would be prudish to compare the rigour at NITIE with that at any other b-school. NITIE has an edge when it comes to location. The campus remains abuzz with corporate interaction all year long. When it comes to guest lectures by corporate biggies, I would be understating if I said we have a problem of plenty. Also, we have the opportunity of joining start-ups in Powai and go for weekend projects all-round the year. And yes, there is also the added incentive of having a ton of cool hangouts nearby. Maybe our neighbour has not heard of it but the industry definitely has or else we would not have such stellar placements. The size of our library is bigger than most B-Schools in India. We have the tallest hostel building in India – Taylor Hall. Our new academic complex almost merits the word ‘luxurious’. We have a lake on campus and two bordering us. The entire campus is WiFi enabled. Need I say anything more? The faculty is an area which is neglected often but should not be. I would suggest aspirants check for themselves the faculty directory and compare the faculty at NITIE with that of other b-schools. The current director of IIM Shillong is a professor in our campus. Our faculty teach fullfledged courses at the IIMs besides giving guest lectures. When the practical learning comes into account all the big case competitions open at NITIE – HUL LIME, P&G CEO Challenge, Deloitte Maverick, Amazon ACE, RB Mavericks, J&J Quest, Nestle Plan-o-Chain, L’Oréal Brandstorm – the list goes on. In fact, there are a few Supply Chain case studies which open only for NITIE. It provides one of the Highest ROI in India. Even students from the Open category are eligible to apply for partial need-based tuition fee waivers. Ministry of Minority Affairs’ scholarship is applicable for students from the minorities. Easily one of the best things about NITIE, the process is one of the most student-friendly ones and you won’t be rushed into accepting an offer you don’t like. Instead of focusing on making records the team focuses on getting quality profiles on campus. Needless to say, all the above mentioned proves that NITIE is Unique and I feel lucky to be a student of such an institute. I am very adaptable and quick learner. I did my Engineering from Anna University, Chennai where I was the only north Indian in the department and the only guy who knows Hindi. It was very difficult in the starting phase to cop up but with time I learned Tamil because we can not change the world the only thing you can change is yourself. Later on, I lead a team for an international event Shell Eco-Marathon. As we all know that Aditya Birla group is India’s largest, and most successful conglomerate. The sector in which Aditya Birla Fashion and Retail limited comes under is the fastest growing sector in India and I want to be part of it. The specialisation provided by Nitie in the field of SCM and operations help me to work in that profile and simultaneously I will be building myself for the competitor world.